I blurred your address but I guess you reckon the Italiano. I had shipped out another 4 units a few hours ago. Still waiting for Raffzahnz's confirmation. Sylvain should be able to receive his in a few days. US orders would take 7 to 10 days was told. EU orders may be up to 2 weeks. I will look up the usb-serial chipset and driver tomorrow. (12-06-2017 03:09 AM)Chris Chung Wrote: Sylvain should be able to receive his in a few days. US orders would take 7 to 10 days was told. EU orders may be up to 2 weeks. But it was easy for me to decode name and address, hopefully harder for others not formerly knowing it. My Prototype has just died on me. A couple of days ago it wouldn't turn on. (12-06-2017 09:58 AM)Harald Wrote: My Prototype has just died on me. A couple of days ago it wouldn't turn on. Sad to know, egoistically I hope this is not the estimated ttl! Too bad for you Harald, hope you will be able to fix it, it might just need a reflow on the chip area. My very 1st builds had problems when I applied too much solder, didn't use tools properly (they were mostly soldered, before I got the hot air gun). Those had ended as scraps. The units I am shipping I had them assembled between March and May this year, the later ones you will find a date label on it. I knew they could have intermittent problems so I don't want to sell them ASAP and let them sit on their batteries. I would turn them on and run some calculations once or twice a week. The standby current is about 0.6uA while the active current should be around 10 mA (or less, can't remember). Over the summer I went travel and forgot about them. When I looked at them after 3 months, I found 1 unit couldn't turn on and 1 unit w/ "ghosted" LCD segments. The LCD is easy to fix by a simple reflow as I know the traces. The other unit I had to reflow the whole chip area. Only last month I decided to sell them as they appeared to be fine. I understand the chance of failure is higher on these units and reserved 2 units as replacements in case one of yours failed within a year. If it failed after one year, consider you paid for one year of entertainment. (12-05-2017 09:30 PM)rprosperi Wrote: It would be helpful if you could post a link to the proper (or at least equivalent) USB-serial cable - there are MANY different brands, configurations, chipsets, etc. and it would be nice to not waste time creating a list of the ones that don't work. Any usb-serial that works on your computer should do. if you happens to have one, try it first. The one I am using is the cheapest I can find that has 3.3V pin, plastic wrapped and it's $1. It is of a PL2303 chip and under Windows it reports a Polific USB-to-Serial Comm Port. Having one w/ 3.3V is better as it will ensure proper voltage during communication. Some devices have only 5V and you should avoid. You will need also 4 female-female jumper cables, these are 20cm, mine in the photo are 10cm, there are longer ones if you need them on a desktop PC. Be sure to get those that can be separated as they need to be criss-crossed. At the back of the NP41 PCB you will find 4 pins marked "Rx Tx + G" for the serial connection. You will connect them to the Ground (G), 3.3V (+), Rx (Tx), Tx (Rx) signals from the usb-serial dongle. Details / parameters for the download can be found here, they are the same as the prototype units Sylvain had before. The last unit for Raffzahnz has been shipped out. I'm also interested in an unit from the 2nd (or maybe 3rd) batch. I received my NP-41. Looks great! Powered up. I am stuck in the Keyboard test. If I hit On then <- I get the battery voltage and it goes back to the keyboard test. What am I doing wrong? (12-10-2017 10:33 PM)mwthomasjr Wrote: I received my NP-41. Looks great! Powered up. I am afraid it might be DOA. The key combo of ON + CLR should show MEMORY LOST. 1) taking out and putting back your battery and retry. 2) make sure battery is relatively fresh. 3) try the ON-ON key sequence. 3) You should try to press all keys in the key test to make sure they are register different values to confirm the button solder points are good and working. If not, if you are able to, correct the problematic buttons. 4) The fact that you are seeing the version screen and can run the key test indicate this is not likely a hardware problem. It could happened that the firmware is corrupted and lead to a reset (say random machine code leads to some exception). 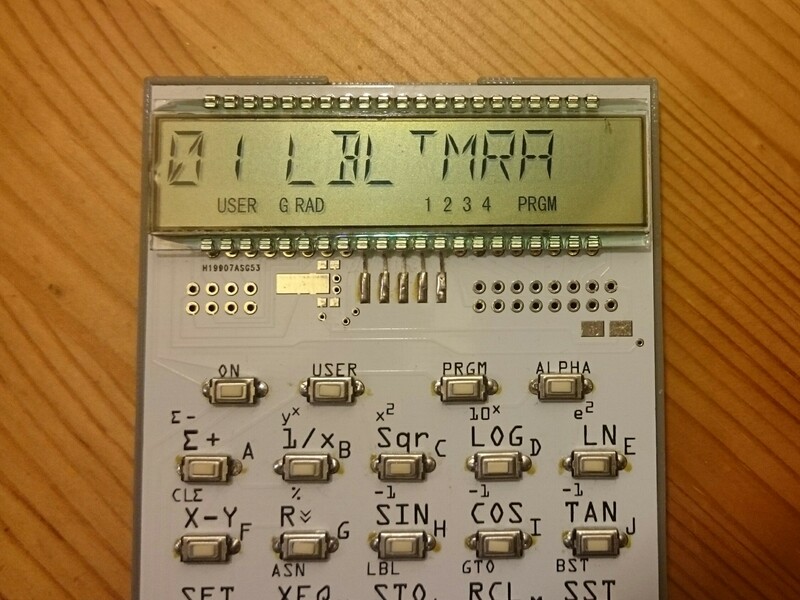 I had it happen before that after trying to load a ROM via serial interface (which writes to the FRAM memory on the fly) and failed, the emulator got confused when trying to do an internal CAT during power-up, leading to failing to enter calculator mode. In this case the thing we could try is to reload the firmware, except that it will require you to either have a TI programmer, or a USB-Serial setup. If you tried the simple tricks and cannot get it resolved, please send it back and I will swap it w/ a replacement unit. I guess I should have done a remove-and-insert battery check routine before shipping these units out. Instead I just did some calculations w/ the units and take their battery out for shipping. Sorry for having disappointed you. If you have received your unit, please provide a quick initial report on any anomaly here so that improvements / corrections can be made if needed. Also as I had not done a lot of testing on the units. Please refrain from using the USB-Serial until I take a closer look at it w/ the current firmware. I will need a couple of days to re-test the USB-Serial to ensure it won't mess up w/ memory. (12-11-2017 06:11 PM)Chris Chung Wrote: If you have received your unit, please provide a quick initial report on any anomaly here so that improvements / corrections can be made if needed. I received my pkg today, I am the proud owner of a lime green NP-41. No problems powering up, all keys recognized in key test, and several short programs I entered seem to work fine. I thought I read somewhere above that there should be some ROM images installed, but in my case, CAT-2 is empty. I noticed that [Shift]- is labeled "FF" and should be "SF" (Set Flag). Well done Chris, I'll report any weirdness or errors if I encounter them. I have received the unit today, Thank you! I see that you have made it a little wider than the previous two beta units, I like it. When you are in bootloader mode, screen blank is expected as the bootloader must be very small code size, the main firmware space is to be overwritten. You will only know it's running via the serial terminal with one single prompt. This is by design. I hope that the ON-ON command works but it is just that the screen buffet did not get updated so you don't see it. Please try to view the display in an angle and toggle ON to see if there are ghosting on the display. Sometimes it takes a few press on the ALPHA, CLR, and or the ENTER key before it refreshes. You can also reinsert the battery and use ON-CLR to do a memory lost reset. Please leave battery out a few seconds as sometimes the capacitor will hold charge and avoid a true hardware reset. I am on my phone right now and will reply more. Had did testing on the serial menu, will report. I had run some test w/ the USB-Serial interface. They appears to be working correctly. I only loaded 1 ROM. To avoid the possibility of corrupting the ROM spaces, I recommend to erase the ROM areas (A, B, C, and D) before loading them (1, 2, 3, 4). You will need to get a bootloader image from me (np41v3.bin). I will put it up on a share drive later. The instructions are all good. And it is better to remove the battery and use the power from the USB cable. So you would press-and-hold [USER] key while plugging in the USB cable, when you got a blank screen, you should be in the bootloader mode. You then use a RealTerm to talk to the unit. Press any key once and you got a '? ', press '@' and you will get a '>' and you can download firmware. Of course it is important not to interrupt the download. It would take about 1 min. [*] However, currently after loading new firmware, NP41 will lock up at reboot, showing "MEMORY RESET" and cannot exit that. It is likely caused by the FRAM memory not cleaned up properly. There is a workaround and you will need to enter the serial menu (remove-insert battery) and do an erase ROM on all the 4 slots (A, B, C, D). Please let me know that you had exhausted your options and I will send you a replacement unit right-away. You will need to send back the problematic unit to me. If you had access to a USB-Serial cable and is confident to try the bootloader, it is also a good option. Let me know the outcome of the additional key-press to identify if there is a genuine problem. Also do you have a USB-Serial cable? I had made available the firmware binary on this shared drive. np41_171212.bin is for use w/ the USB-Serial bootloader. np41_171212.hex is for use w/ TI LaunchPad and other programmers. There is only one change w/ the shipped units. I had add a ON+TAN in the cold-start menu (i.e. after remove-insert battery). Function is same as the ON+TAN in the warm-start menu, to erase all the 4 ROM spaces. It may benefit some unit freeze condition. +Harald may want to try the hex file which is the latest and see if it solves your problem. I've received the NP-41 today. It works perfectly. 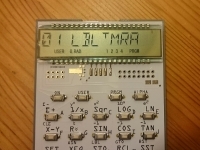 I love this LCD display ! Thanks Chris for this nice little device, the perfect companion for my NP-25. I've done a quick speed test with a prime test program, the NP-41 is 2.3 times faster than my 41CX: it takes 17.8s to find that 1000003 is prime vs. 41.2s on the 41CX. The 3D printed case is a nice addition, I'm thinking to design a similar one for the NP-25. There is just one thing I need to improve: the keyboard is very noisy with the case, maybe some foam in the case under the keyboard will reduce the noise. The key test show a unique code for each key. ON-CLR only continues the keycode test or goes to the voltage screen. I have power cycled several times by removing and reinserting the battery. I have tried 3 different new batteries. I tried to connect the serial but could not get the bootloader. I didn't connect the + because the only serial I had was +5V on power. It is 3.3V on RX and TX. I eventually gave up on this. My only disappointment is not being able to play right away, but a little patience will not hurt me.